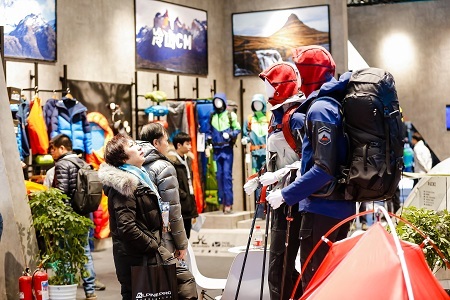 More than 400 exhibitors representing 682 brands and approximately 30,000 trade visitors and key opinion leaders (KOLs) took part in ISPO Beijing and Alpitec China held at the China International Exhibition Center (CIEC) from January 16 to 19, 2019. This year, the most important sports trade fair in the Asia-Pacific region was jam-packed with numerous forums, trends and innovative products and services relating to winter sports, outdoors, health & fitness, and manufacturing & suppliers. Soccer also featured for the first time. The specially created Football Activation Area played host to seven German first-league teams, namely Bayer 04 Leverkusen, Borussia Dortmund, Borussia Mönchengladbach, Eintracht Frankfurt, FC Schalke 04, VfB Stuttgart and VfL Wolfsburg. They challenged visitors to take part in various activities such as Speed Goal and Goal Wall Shooting and created a thrilling soccer atmosphere for them. The program also featured the Football Forum, which was held on the opening day of the trade fair. High-profile speakers from the clubs set out their strategies for activating the market in China and presented concepts for promoting and encouraging fresh young talents as well as ideas on brand positioning. Winter sports have proven to be hugely popular for several years now, especially in view of the upcoming 2022 Beijing Winter Olympics. As well-known brands and exhibitors in this segment, Burton and Oakley made a welcome return to ISPO Beijing. The Market Introduction Program, designed for brands keen to penetrate the Chinese market, also focused on this area. As part of the two-day seminar program, representatives of ten brands from across Europe, Asia and the U.S. gained a solid understanding of the specific ins and outs of the Chinese market thanks to industry experts in distribution, online and offline retail and commercial law, and made preliminary contacts. Ski Resort Tour participants were given an insight into the infrastructure of the winter sports resorts and treated to a taste of what to expect from the Olympics. Three 2022 Winter Olympics training venues and sites were on the itinerary, namely the Shougang Olympic Park, Wanlong Ski Resort and Genting Ski Resort Secret Garden. An extensive supporting program was also provided for the other trade fair segments. The Sports Industry Forum focused on the topic of new investment opportunities for the sports business in China, including with regard to digitalization. Sport injuries and rehabilitation options were the main focal points of the Health & Fitness Forum. The China Climbing Report was published as part of the China Rock Summit. In the ISPO Textrends Area, international consultant for textile trends, Louisa Smith, presented the textile trends relating to materials, fibers, cuts and accessories set to take the industry by storm in the next few years. At the ISPO Award Exhibition and the ISPO Startup Village, visitors gained an overview of the most important innovative products and latest ideas to be devised by young entrepreneurs. An international advisory committee has been set up in order to further develop and bring ISPO Beijing even more in line with the needs of the market, exhibitors and trade visitors. Representatives of exhibitors’ interests, industry representatives and partners met for the first time ever on the eve of this year’s event in order to discuss the strategic direction of the trade fair. The consensus amongst all participants was that the current format of ISPO Beijing represents a solid base with plenty of potential. New segments such as Sports Fashion and Travel should be added to the event in the future and the target group of key opinion leaders (KOLs) should be further expanded. Exchanging experience with Europe is the primary focus of interest. In addition to considering future developments and upcoming trends, Messe München also took the opportunity to reflect on the past as part of the 15th anniversary of ISPO Beijing—more specifically, on 15 years full of challenges, changes and success. During the official birthday party, the ISPO team honoured the five exhibitors which have been part of the trade fair ever since it was launched.